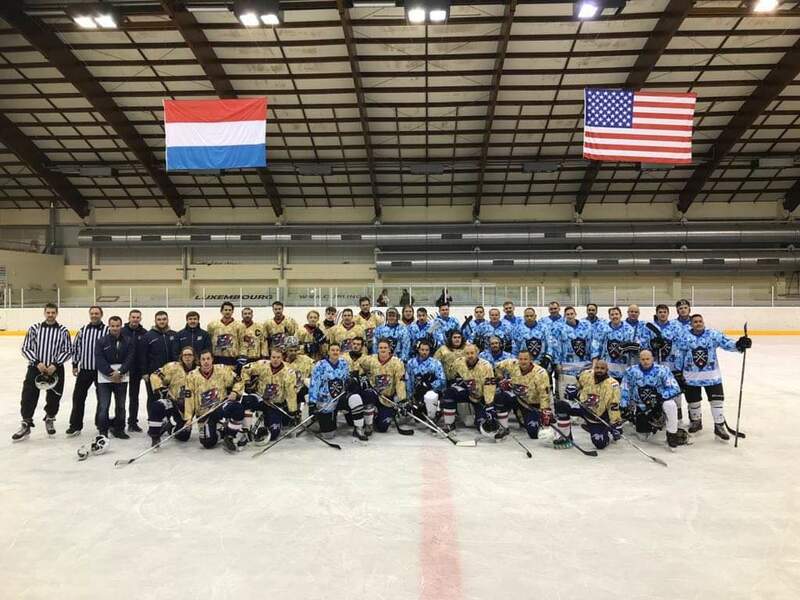 For the second time, Tornado Luxembourg together with the ice hockey team from the U.S. military base of Spangdahlem, and thanks to the generous support of the U.S. Embassy in Luxembourg, hosted a Veterans Day Hockey Game. In front of 500 people, a new season record, Tornado won 17:3 on November 17, one week after Veterans Day and the 100th anniversary of the end of WWI. But don’t let yourself be fooled by the score as it fails to transmit the joy and pride players felt playing this friendly game. Among those players, there was Robo Beran who, after a terrible skiing injury last year, made his first appearance on the ice alongside his sons Thierry and Markus Beran, while his grandson was watching from the bleachers. Everyone around could see the pride in his eyes when Markus, assisted by his elder brother Thierry, shot his first Tornado goal late in the last period. And then, there were the rookies, many of whom were in for their first senior game. Anyone passing near the bench could hear them enjoying themselves, teasing each other about missed passes and blocked goals. During breaks, the young figure skaters of the Patinage Artistique entertained public and hockey players alike with an impressive display of talent and skill. The score also fails to tell you about U.S. Ambassador to Luxembourg J. Randolph Evans stepping on center ice and dropping the puck in a gripping opening ceremony in honor of all those young men and women who served their country so bravely, whether they were fire fighters, police officer, or soldier. Flanked by two WWII re-enactors from the 26th Yankee Division Luxembourg, who had joined the Military Museum of Diekirch in a small exhibition fair prior to the game, Ambassador Evans joined both teams and the 500 spectators in the celebration of duty, honor and sacrifice as taps, followed by national anthems, filled the Kockelscheuer Ice Rink with gravitas and dignity. Written by Teemu Hinkula, 18/11/2018 10:36.